Today I've been working on a new book project. I should be done with the book dummy soon, since I just sent off my last book dummy to a publisher and have some time to work on this new story (I'll let you know if I hear from the publishers about the dummy I just sent off). Anyway, I've been experimenting with the best way to tell the story. 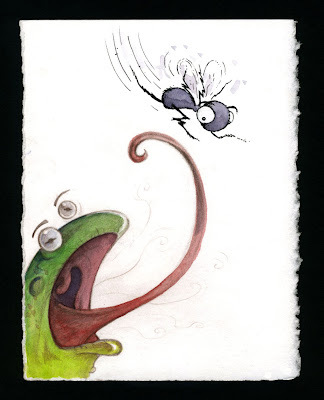 The fly at top is ink with watercolor, and the bottom is pencil with watercolor. You'll probably see more of this kind of stuff soon. Later! I like your watercolor stuff. Especially when you use watercolors on top of ink drawings. Fabulous!